Preheat the oven to 180°C (160°C fan) and line a 12 standard size muffin tin with cupcake cases (biodegradable is best). Sieve together the ground almonds, flour, baking powder and salt in a bowl and set aside. Place the egg yolks, vanilla paste and sugar in a large mixing bowl and using an electric mixer, beat together until pale in colour. Add the oil and water and combine using a hand whisk. Fold the beaten egg whites into the batter mixture using a large metal spoon or spatula (at first just a little to loosen the mixture, then gently fold in the rest). To make the buttercream, place the egg whites in a large heat proof mixing bowl (I use a free standing mixer). Place the sugar and water in a small saucepan and boil until the temperature reaches 116°c. Remove from the heat and slowly add the hot sugar syrup to the egg whites while whisking the whites on a high speed. Continue whisking on high until the meringue is stiff and glossy. Slow the mixer to a medium speed and whisk for a few minutes until the mixing bowl is cooler to touch (i.e. the meringue reaches room temperature). Add the soft, room temperature butter, vanilla paste and salt and whisk on a high speed until smooth and glossy. (If after a few minutes of mixing the mixture splits, the butter might be too cold - warm the mixing bowl gently using a bain-marie then whisk on a high speed again. If the buttercream looks very runny, the butter or the meringue might be too warm - cool the mixing bowl for a few minutes in the fridge, then whisk again on high). 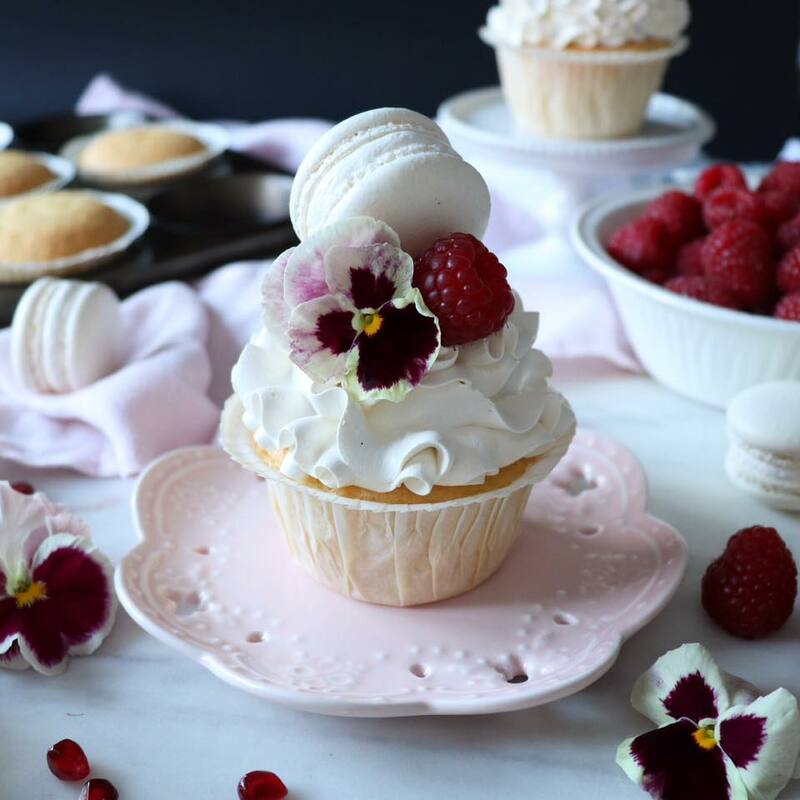 For a frilly decorative effect, pipe the buttercream on the cooled cupcakes using a Wilton 2D piping tip. 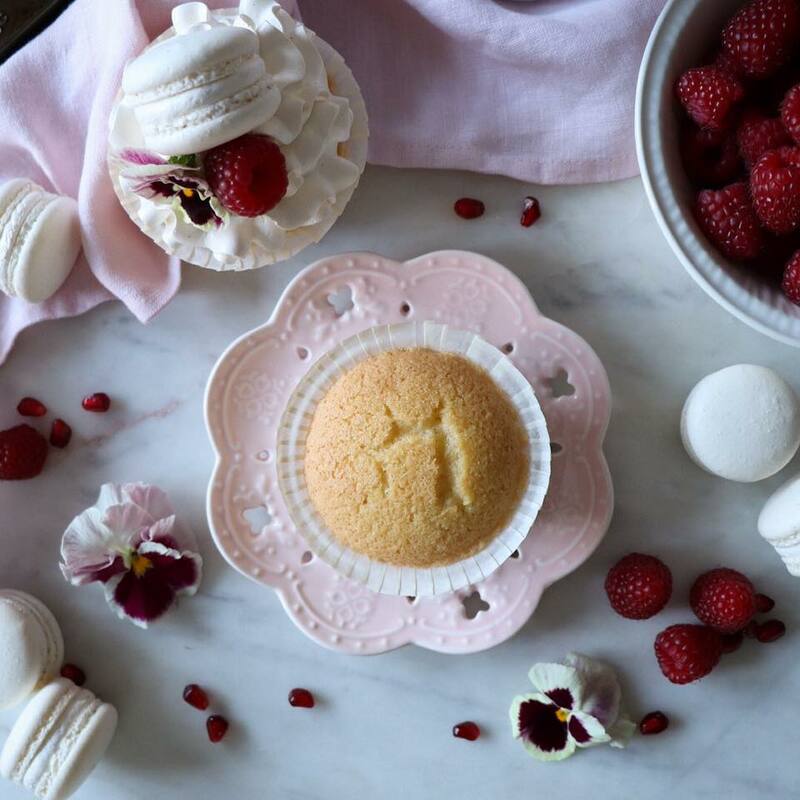 Decorate with vanilla macarons, fresh seasonal berries & edible flowers. Enjoy!